Small businesses keep hiring, but the pace of job growth remains feeble. The smallest companies -- those with fewer than 50 workers -- added only 58,000 jobs in May, according to a report Wednesday by payroll-processing firm ADP (ADP). That is a slight uptick from the previous month, but it does little to buck the trend so far this year: Small business job growth is experiencing a general decline. 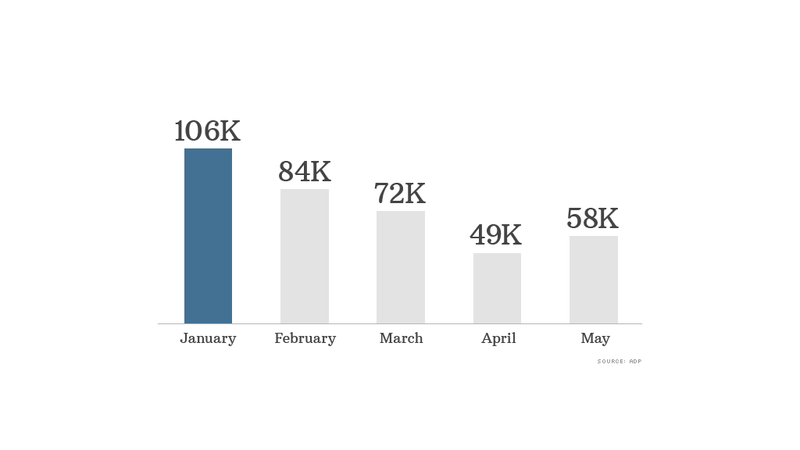 According to ADP data, small firms started the year strong, creating 106,000 jobs in January. But hiring has since tapered off. "Owners are very pessimistic about the future of the economy, and they're not making any bets customers will come in to generate extra revenue to pay for these workers," said Bill Dunkelberg, an economist with the National Federation of Independent Businesses. Firms with fewer than 50 workers make up the vast majority of small businesses in the United States -- 97% of the 6 million companies recorded by Census data. They employed just over 31 million workers in 2010, the latest data available. Several other economic indicators this week mirror ADP's report. A small business employment index by payroll processor Intuit (INTU), which measures firms with fewer than 20 workers, edged up slightly. But it remains near the same level it was at during darker economic times in May 2009. Susan Woodward, an economist for Intuit who helped build the index, blames sluggishness in the construction industry. A disproportionate number of small businesses are in construction -- anywhere from 9% to 18%, according to Census data. And construction has yet to make a full comeback, evident by the annual rate of new residential homes being built: 853,000, which is far below the average at this time of year. "The recovery in small business has been really weak compared to the economy overall," Woodward said. "If we can get construction back to normal, we'd almost be back at normal employment levels." Related: A tornado destroyed my business. Now what? Yet another sobering report came from NFIB. Its monthly small business survey, released Wednesday, showed that hiring is at a standstill. Of the 715 business owners questioned, 9% added 2.6 workers on average, 12% cut about three jobs, and 79% didn't change the size of their staff at all. Dunkelberg, who authored the report, said that instead of increasing hiring, small firms have actually just reduced layoffs. Are you hiring? Cutting staff? Adding or cutting hours of your employees? Email Jose Pagliery and share your story. Click here for the CNNMoney.com comment policy.